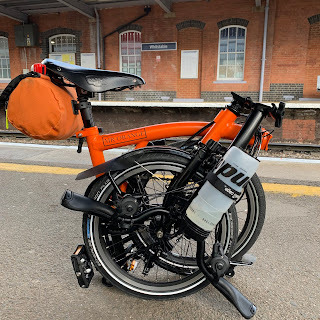 My Orange Brompton: Quarter of a Million!! You may or may not have noticed of late but I have resisted posting how many page views I have managed. I have been extremely busy of late and haven't really given the figures much attention. I did look at then today however and I was pleasantly surprised to say the least. I have now passed quarter of a million page views! I can hardly believe it and I just wanted to thank you out there for reading my ramblings. If you are new, welcome. If you have been around for a while, welcome back. Whoever you are thank you! There is a great deal more to come in the next few weeks so keep coming back - and tell you friends!! Congratulations! After finding your blog a few days ago, I've done my part in upping your page views, reading your entire archive of posts. It is a fascinating journey you've been on, and you have exciting things to look forward to. I've had it in the back of my mind to purchase a Brompton, but can't justify it to myself yet, let alone the keeper of the checkbook. :) It would be quite the change from my Xtracycle extended cargo bike. My daughter has a Smart Car, and the Brompton would be a perfect bike for her. Welcome Steve. I am glad you like my humble offerings on this blog so thank you very much. As you have surely read owning a Brompton is great fun and it really is personal transport you can take anywhere. The cost is high but you are buying something truly handmade - very rare in this day and age - that is near bombproof. It is funny you mention the Smart Car as I know three people who own one the same colour as their Brompton. Thanks again for reading, spread the word and keep coming back for more.